A joint effort of the Gates Public Service Law Program and the UW Public Interest Law Association, PILA Corner as an Op-Ed space for members of the UW Public Interest Association and other student public interest leaders at UW Law School addressing public interest topics such as social, economic and racial justice, human rights, volunteerism, leadership, internship experiences, public interest careers tips and more. 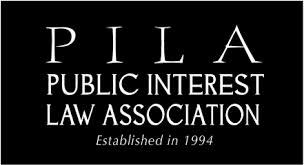 PILA Corner postings and content express the views of the author(s) only and does not necessarily reflect the views of the UW Public Interest Association or UW Law School and are only listed for identification purposes. Submissions are welcome by all UW law students and graduates. For submission guidelines please contact Huy Nguyen, Assistant Director, Gates Public Service Law Program at cuu@uw.edu.